The earliest traces of quarrying for Beer stone date back 2,000 years to the times when England was part of the Roman Empire. The Roman occupation of Devon established two main settlements at Dorchester and Exeter. Seaton, midway between these two Roman towns became a Roman ‘station’ and Axmouth Harbour became a major port for the area. The stone at Beer is true ‘freestone’ that can be sawn or squared up in any direction due to the uniform structure of the rock. Freshly quarried it is easy to carve but hardens on exposure to the air,turning a beautiful creamy white colour. Roman stone masons would have searched for a local source for stone and would have recognized the qualities of the stone they were searching for at the foot of the chalk cliffs at Beer. Quarrying of the stone needed to take place inland, and an outcrop a mile from the coast was discovered on the northern slopes of Beer Head and became the site of the stone workings as the Roman quarry men started to work the seam of stone downwards far under the chalk. The traces of Roman workings can still be seen today, the rounded arches of the first chambers are characteristic of the Roman method of working and traces of the hand tools used can still be seen on the walls of the rock chambers. After the departure of the Romans in the 5th century, the Saxons continued to work the quarry in a square cut style, which contrasts obviously from the rounded Roman style. It was the Normans with their building of Churches, Cathedrals, Castles and Manor houses who next quarried Beer stone in some quantity. Norman stone masons appreciated the ease with which Beer stone can be delicately carved for all manner of decorative building work and then once exposed to the external air the resulting chemical reaction turned the stone hard and durable. The Norman and later workings are in side passages off the long straight Saxon passage. These large chambers can give visitors the impression of being in an underground cathedral, the roofs of the chambers are supported by massive un-quarried pillars of stone, each crowned with Norman capitals and with side chambers leading off in all directions. After 1540 because of the English Reformation the quarry was worked intermittently and most of the stone went to non–religous buildings. During the victorian religous revival and increase in church building the quarry became busy once again. In these workings, the stone has always been cut by hand. Each cut stone would be generally a 4ft cube and would weigh approximately 4 tons. The technique of cutting the stone blocks hardly varied since Roman times. Working in gangs of 4 to 5 men, one of the gang, a Picker would cut a breach or space at the top of the stone with a pick-axe, giving room for the rest of the gang to work on the stone. The gang used pick-axes to cut down the sides of the stone. Steel wedges would be driven into the bottom of the block to break it free of its surroundings. Each man was required to produce one 4-ton block a day working only by candle light in dangerous conditions. If the stone block cracked, they would not be paid for the day. As the quarrymen had to buy their candles to work by, this is the origin of the expression ‘not worth a light’. Horses (or oxen) hauled the cut stone out of the workings. Black powder (Gun Powder) was first used in the stone cutting process in the 16th century. The blast from a small amount of the powder made the initial cut, (breach) at the top of the stone. The roughness of the roof in later workings shows where the quarrymen used black powder in this way. Many of the supporting roof pillars near to the entrance look reduced in width. This is a technique known as ‘pillar robbing’. Pillar robbing is common in mines where pillars support the roof. As the mine runs out of stone that miners can remove without problems, the miners find it easier to take the better quality material from the pillars rather than work fresh material deeper in the mine. 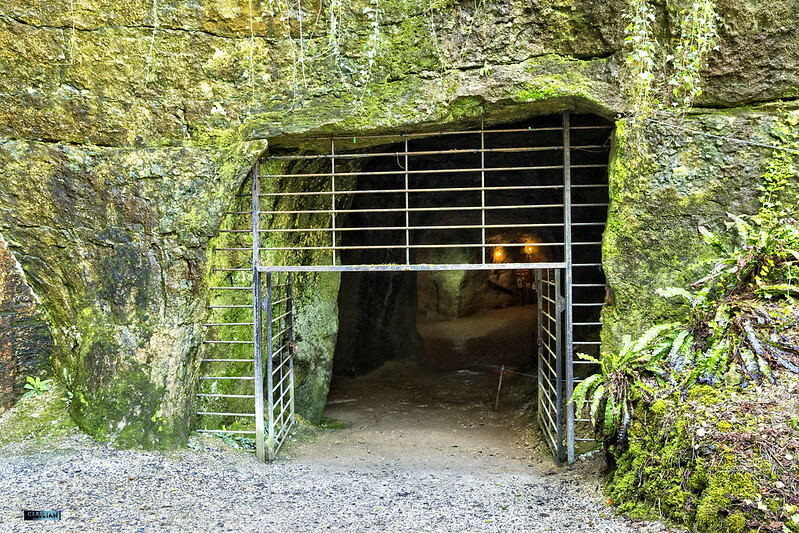 Large-scale underground mining finished in Beer in the 1920’s due to a geological fault. Stone from Beer has been mainly used in Church construction. The stone has been found in Saxon and Norman churches, and buildings like Westminster Hall and Abbey, the Tower of London, Winchester Cathedral and Exeter Cathedral.